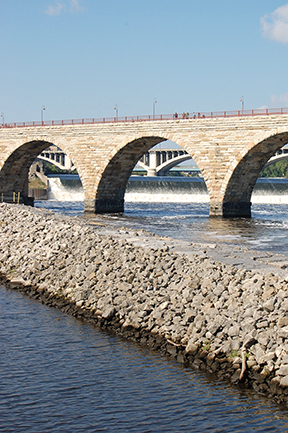 Take a Twin Cities bridge tour and see engineering in action. That new chill in the air these days keeps reminding us that autumn has definitely arrived. It’s a beautiful time of year to be outside in Minnesota – good-bye mosquitoes, hello fall colors! While you are touring the cities in search of the best arboreal displays, why not add some engineering to your itinerary? Take a tour of Twin Cities bridges both new and old. It’s a great way to learn a little Minnesota history as well as brush up on your bridge knowledge. We’ve made it easy with a quick run-down of a few of our favorites and a check-off sheet that you can download and take with you as you find these urban treasures. Looking for a quick refresher on different types of bridge construction? Find a helpful guide to bridges here. Uses: pedestrian and bike traffic. 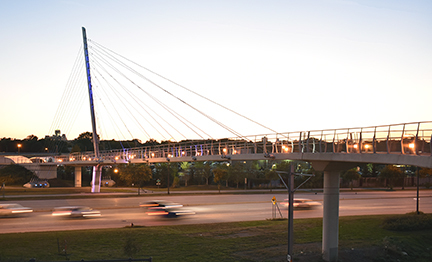 One of the newer bridges in the Twin Cities, the Martin Olav Sabo Bridge was the first cable-stayed suspension bridge in Minnesota. Cyclists and pedestrians enjoy using this bridge to travel along the Midtown Greenway and to get a great view of the Minneapolis skyline. Next up is a two-for-one deal. The Stone Arch Bridge and the Merriam Street Bridge. Of all the bridges that span the Mighty Mississippi, the Stone Arch Bridge is the second oldest, as well as the only arched bridge made entirely of stone. 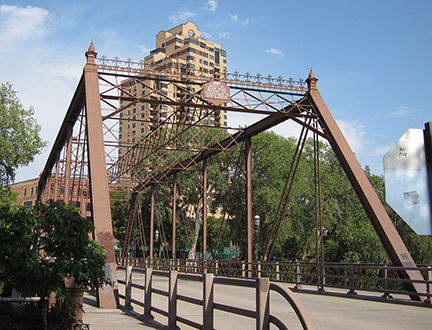 From there, take a quick walk, bike ride, or drive over to the Merriam Street Bridge (photo via wikimedia commons). You might not have known this unique bridge was here but it’s worth adding to your bridge tour. Originally one of four trusses from the Broadway Avenue Bridge, it was put in place in 1987 in it’s new location near Saint Anthony Falls. Decorative flourishes can be found throughout this bridge. Don’t forget to look up as you cross to see the dainty finials that help give this bridge it’s charming look. 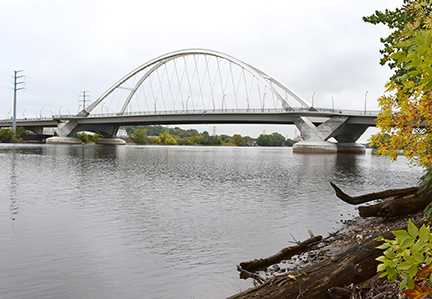 The last Minneapolis bridge on the list is the Lowry Avenue Bridge. 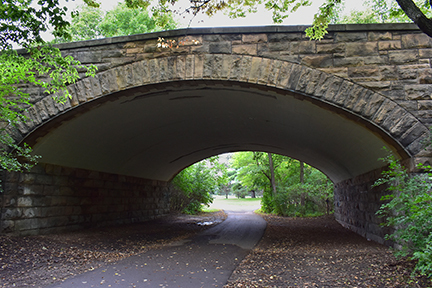 Although this tied-arch bridge is relatively new, it was built to replace an earlier truss bridge built in 1905. It might be a good idea to plan your visit to this bridge in the evening so you won’t miss the multi-colored lights that are used to illuminate the bridge for different occasions. Find your favorite color on the bridge lighting schedule. One of just three vertical-lift bridges that cross the Mississippi river, this bridge features 105 foot high towers that allow the bridge span to be raised 37 feet. While it is fun to see this bridge in action during an actual visit, you can also check out a video that will show you what makes vertical-lift bridges so special. 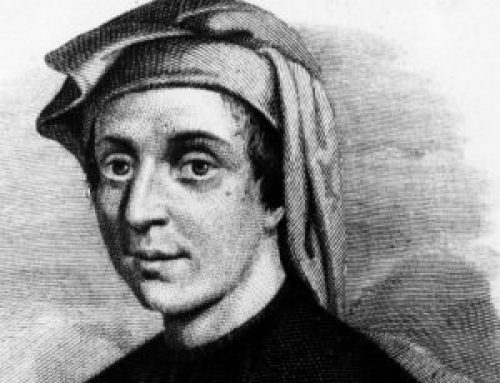 Last on the tour is another two-for-one deal. Bridge No. L-5853 and Bridge No. 92247 in Saint Paul. Here are a couple of bridges known better for their beautiful setting than their clever names. 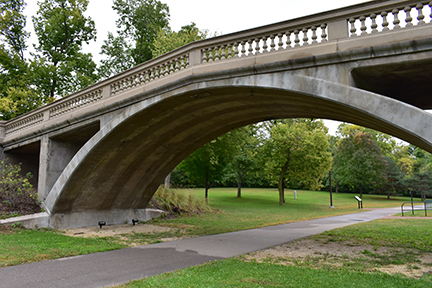 Originally constructed to cross over the Como-Harriet streetcar line, these bridges were both built using the Melan Reinforcing system. This system allowed bridges to be built quicker and stronger and it soon became the method of choice for building arch bridges in the United States. These beauties are just feet from one another so seeing both in one visit could not be easier. Any amount of autumn sight seeing you do in the Twin Cities is bound to include a few bridges along the way. This list is one fun way to take in some of those sights, but making up your own “Best Bridges” tour is a great family activity as well. Or, why not expand your tour beyond the Twin Cities? 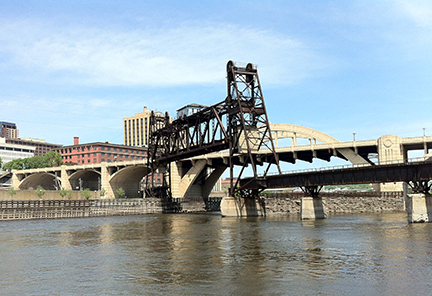 For inspiration, take a look at the MN Department of Transportation’s list of Historic Bridges, Historic Bridges.org or this overview of notable bridges in Minnesota. Ready to build your own bridge? 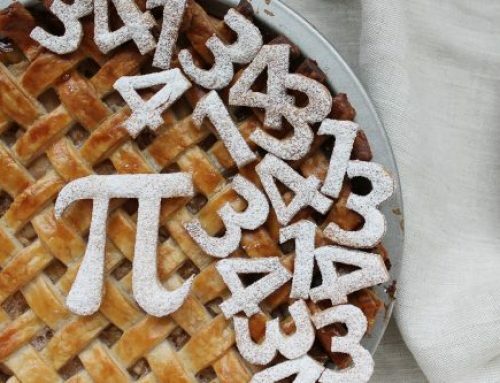 Check out this fun activity from Scholastic.